I hope all is well with the Fort Lewis community as we each in our own way prepare to enjoy the Holiday Season. Before leaving Iraq last September after having embedded with 4th Brigade, 2nd Infantry Division for about five weeks, a soldier asked me if I would consider returning to FOB Warhorse around Christmas time. His question stuck with me. Last summer marked my third embedment with Fort Lewis soldiers, and I believed at the time that it would be my last embedment. Frankly, I did not like the idea of putting my wife through the worry that every wife (or husband) experiences when her husband (or his wife) enters a potentially dangerous situation. Why would I want to do this to a woman who has given me so much? But like I said, the soldier’s question kept nagging at me. I tried to rationalize the query away. I have a good position at Pierce College; I have children to look after; I have the Christmas season to look forward to. And why would I put up with the myriad of obstacles I face getting into and out of Iraq? In other words, I had a lot of reasons … good reasons … to not come back. But I did. I came back. All because one soldier in Bravo Company, 1st Battalion, 38th Infantry Regiment asked me a question. A question that would not go away. So I talked with my wife. My wife said she would support whatever I decided. She knows better than anyone how much the idea of being with my “brothers” and “sisters” means to me. She understands that the stories I write and the images I make of your loved ones are important to you. Please bear in mind that I cannot talk to and write about everyone in the brigade. I occasionally get comments complaining about how I did not photograph or write about so-and-so’s son or daughter, husband or wife. Like I can be everywhere for everyone. It’s not going to happen. Just remember that this is a big brigade and that I have a very limited amount of time (I am working on my time off between academic quarters at Pierce College) while here. Then I talked with two other people. Those two would be Donna and Jordan Haines, the owners of Coinforce.com. They also understand what it means to be in the military and how family members miss their loved ones during the holidays. For the second time, they put the money up which allowed me to return. Were it not for them, I would not have been able to embed this past summer or now. The Haines have been instrumental in allowing me the opportunity to give you a glimpse into what good … and I emphasize good … our soldiers and your loved ones are doing here. 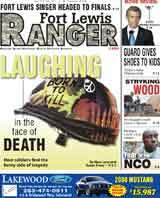 The Ranger Newspaper will carry my stories and images. KCPQ, Channel 13’s reporter and news anchor Lara Yamada will also carry my images and comments during several news broadcasts. And I will do my best to do what I do in the time I have … to tell the stories of good soldiers doing good work in Iraq.